A doctor was using an app on their cell phone while writing a medication order on the patients chart. The patient needed a lower dose on the medication. In the middle of writing the order,Â the physician received a text message from a friend.Â They got involved in responding to the text and forgot to go back and write the order to reduce the dosage of patient’s medication. The patient became toxic and almost died. Not everyone has such dramatic consequences from the new normal of distraction, most people just struggle with irritability, fatigue, lack of focus and loss of creativity from the inability to manage the overload of demands from technology.Â Today technology’s ability to do more has surpassed most people’s ability to manage it.Â Instead technology is managing people. Â With alerts from email, texts, social media and calls along with the already busy demands on attention from work, overload is now the new normal. Gallup has reported 80% of the population state they have stress at work. 50% of the population says their stress has increased in the last 5 years. CDC reports that today 80% of medical expenditures are due to stress. 25% of driving accidents are due to distracted drivers. 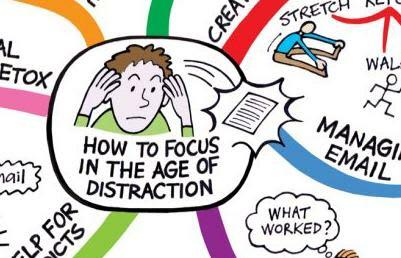 Distraction increases the stress reaction and vice versa. What makes distraction desirable is the immediate connection with someone with texts and instant messaging. There is an unspoken expectation between many people they will be accessible all of the time. Having this connection feels good as long as you can get the fix.Â Without it, internal distraction increases with wondering and waiting for the response. First structure your day so you have time out from your technology. During these times you turn off your phone, email and all distractions in order to focus on the task.Â If you know the first part of your shift is difficult and requires your focus in order to stay ahead of the workload, turn off all personal devices freeing your mind and any other distractions. You can send out a message to your friends and family letting them know you are unplugging and will not be available.Â You will actually feel relief not having to think about so many things at once.Â Mental fatigue contributes to irritability and disorganization. When faced with a difficult task, it is tempting to check for a text or a message.Â It takes practice to build up your ability to stay on task. It is worth the effort. Stick to this non negotiable period of unplugging and practice focus.Â If you want to enjoy your day more and increase your ability to solve problems, think through issues quickly, improve concentration, listen better and communicate more effectively, Â practicing focus will help you do that. The brain is capable of amazing results when allowed to concentrate on one issue at a time; having to shift all its resources from one thing to another decreases performance by as much as 40%. Developing the ability to focus is a new skill that will set you apart from your peers. Distraction and as a result disorganization is epidemic.Â You are in control of where you direct your attention. The problem today is most people are in a chronic stress mode making the need to stay connected or check personal devises as urgent. This is the nature of the stress reaction, creating a false sense of urgency.Â What is actually important is obscured by this urgency. One of the problems with distraction is the lack of memory and recall. The more you sustain your focus the greater you build up your working memory. This will continue to serve you throughout the week as you are able to call upon this information. Make it a habit to sustain your focus at different times during the day. Set up routines and structure to encourage this focus. Â Unplug and work up to taking days off at a time. Take control over your time and how you spend it.Â Â Your performance depends on your ability to focus as does your enjoyment in your day.